Why be the sheep, when you can be the wolf? Seventeen-year-old Ismae escapes from the brutality of an arranged marriage into the sanctuary of the convent of St. Mortain, where the sisters still serve the gods of old. Here she learns that the god of Death Himself has blessed her with dangerous gifts–and a violent destiny. If she chooses to stay at the convent, she will be trained as an assassin and serve as a handmaiden to Death. To claim her new life, she must destroy the lives of others. Ismae’s most important assignment takes her straight into the high court of Brittany–where she finds herself woefully under prepared–not only for the deadly games of intrigue and treason, but for the impossible choices she must make. For how can she deliver Death’s vengeance upon a target who, against her will, has stolen her heart? Before I had time to stop and think if I even wanted to read the book had read 150 pages. Although I could guess the plot line I still wanted to keep reading, and was pleasantly surprised when the author didn’t provide the normal round up of the storyline but left it with a realistic outcome. Interesting characters great storyline; the perfect mix of romance and adventure to satisfy all readers. I so enjoyed this book and was very upset when I finished it. 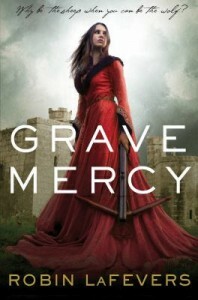 I immediately starting looking for more of Robin LaFevers books and was surprised to find that Grave Mercy is part of a series (His Fair Assassin) and the second book (Dark Triumph) is already out. I am already three quarters of the way through Dark Triumph and am enjoying it even more than Grave Mercy. This entry was posted in Fiction, Historical Fiction, Young Adult and tagged Author, book review, books, Grave Mercy, Parramatta City Library, reading, Robin LaFevers by admin. Bookmark the permalink.